the CBM II (and I) series of computers! 111016: Version 1.10 released. Slighly improved graphics. Selectable difficulty level added. cool music and sound effects from Max Hall added, no more known bugs! The CBM II series of computers was produced after 1982 by Commodore Business Machines Ltd. (CBM). The most popular machines were the Commodore 610, 620, 710 and 720. In the US they were called B128, B256 and CBM 128-80 and 256-80. The older but more popular CBM I machines are called CBM 8032, CBM 8096 and CBM 8296. Space Chase can be played by one or two players. 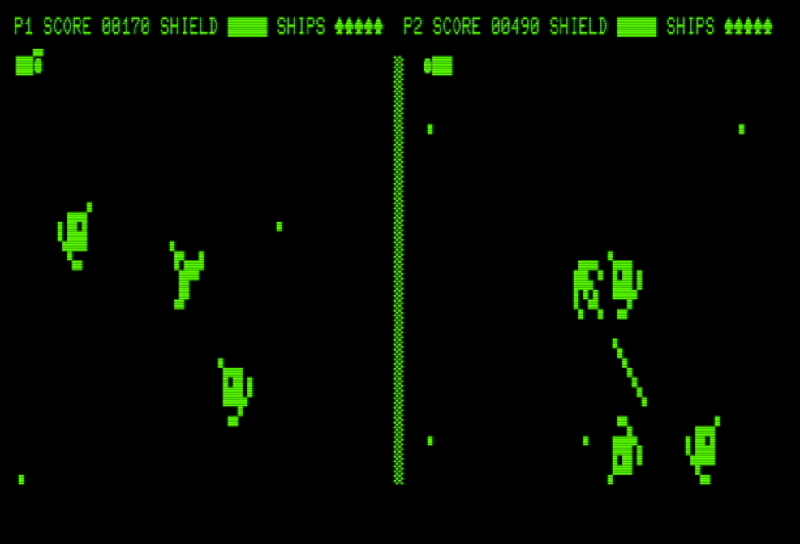 In one player mode, the computer takes over player 2. It's most fun when played in 2 players mode though! The CBM II series is a "text only" system. It doesn't have any graphics capabilities at all. Using the CBM's character set in a smart way, Space Chase manages to create a 160 x 50 resolution that is fully used by the game. On the CBM I series only 80 column machines with the CRTC chip are supported! Space Chase is the only known game that REALLY uses to SID sound chip in the CBM II to its max. Thanks to famous SID composer MAX HALL for the great title music and sound effects!! The CBM I machines do not have a SID chip. The current beta is silent but sound will be added later. 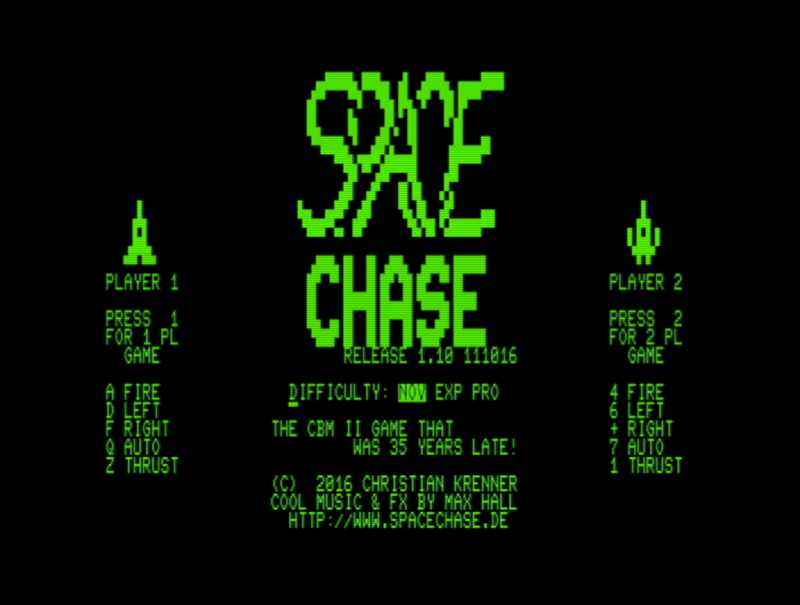 Unlike many other games for old CBM computers, Space Chase is fully programmed in assembler. Therefore it uses the full speed of the 2 MHz 6509 processor inside the CBM II. On the CBM I machines 8032, 8096 and 8296 the current beta runs slower since their processor is clocked at only 1 MHz. VICE emulator which is available for many platforms. Just download the latest version for your operating system, start the "CBM2" emulation, make sure you choose the "8050" floppy drive and insert the Space Chase disk image called "SpaceChase.D80". After the CBM II has started up, you load Space Chase with the command DLOAD "SPACECHASE" and the run it with RUN. That's all! Your goal is to shoot the other player. Whoever loses his/her 5 lives first, loses the game. There are 6 enemy ships allied to each player that will try to attack the opponent player. They don't shoot, they just bump into it to distract the other player. 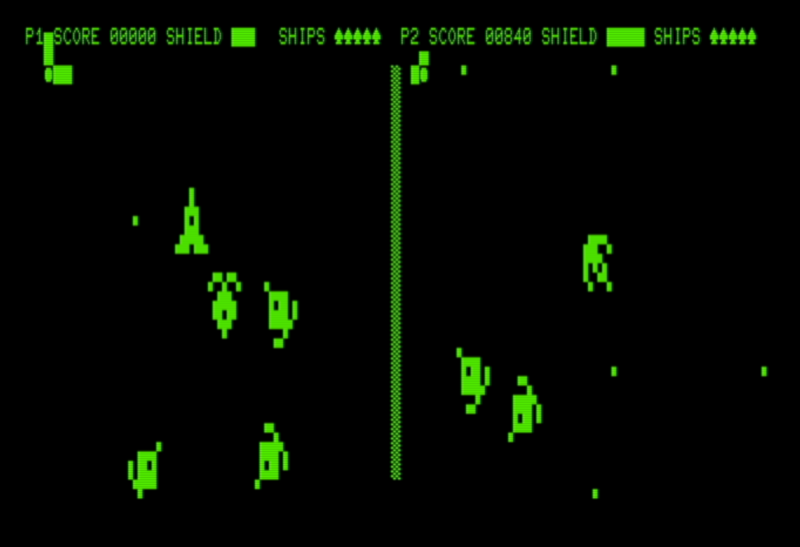 Players and ships have a protective shield, so they are not killed upon the first hit but have to be shot at several times. The players' shields recover over time. So if you are just about to die: Run away and let your shield recover! After a certain number of deaths the enemy ships will drop gems that you can collect. The gems will recover your shield or give you extra fire power or lives. So try to catch them! On the title screen you will get instructions on the keys used to control your ship. Also, you can choose 1 or 2 player mode. 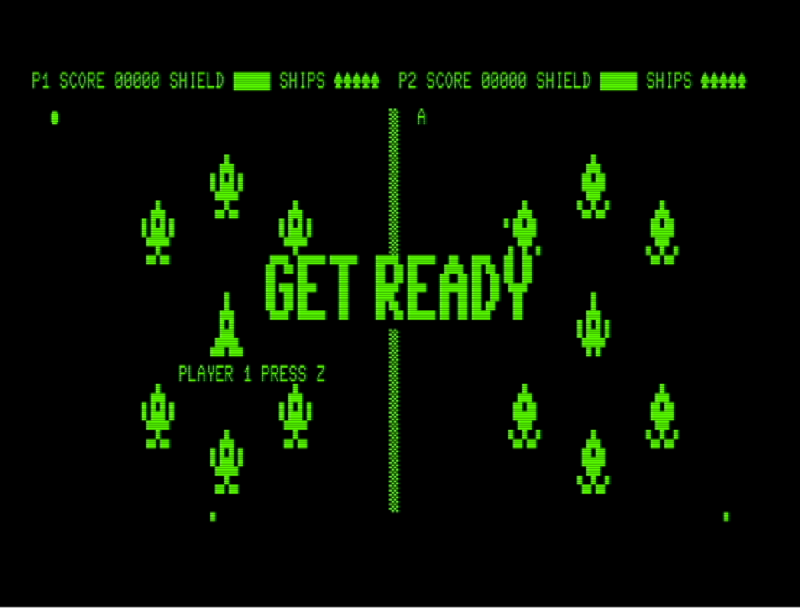 In 1 player mode, you are controlling player 1 (left part of the screen) while the computer takes over player 2 (right hand side). Your controls are "space like": You can only rotate your ship left or right and accelerate your ship in the direction you are facing. The lack of gravity in space will keep your ship flying in that direction until you (counter-)accelerate. This will need some getting used to but makes the game more challenging. The "thrust meter" in the upper left corner of each screen half will show the direction your ship is currently heading. Since the playfield is huge, you can easily get lost. The "auto pilot" key will make your ship turn and accelerate automatically towards the opponent player. It will do so until you press another key. 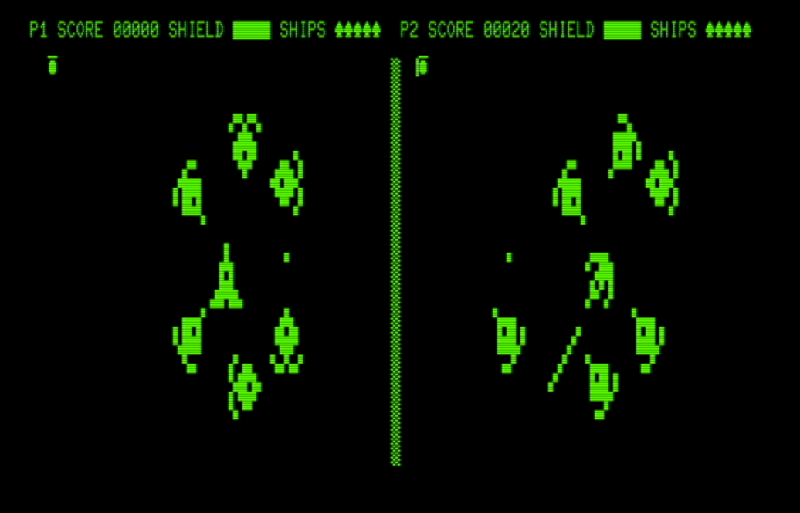 This video shows (an early version of) Space Chase played on my Commodore B500 computer. First enjoy the great title music by Max Hall. Gameplay starts around 1:30.